On Wednesday the 14th of November I went along to the Oxford Road Turtle bay. I visited it to try their new Christmas food and drink menu before it’s release. Three new secret cocktails and a myriad of food options, the Caribbean jaunt has everything you’ll need for a Christmas night out with a tropical twist! Their Christmas menu sees Caribbean festive food in full force. There’s a set menu for under £20 a head for two courses (for a pre-booked minimum of 6 people). To start; 24-hour spiced jerk wings, roasted duck rolls with sour orange chutney or sweetcorn and scotch bonnet fritters (I had the pleasure of trying these and they were delicious). The chili, garlic roasted shell-on king prawns and mango mole, lime calamari also sounded delicious. Moving to some mains you can choose from jerk-glazed, slow roasted pork belly with coconut rice and chili pineapple salad, Curried goat with sweet onion chutney, plantain and dumplings or a crispy-skin jerk salmon with the same rice and plantain combo. There were also a few other jerk chicken, steak and aubergine curry options. Admittedly, I don’t see a large departure from their current menu to this Christmas menu. However, I’d be excited to see whether these dishes pack the banquet-style Christmas vibes that the festive time begs for. Equally, booking for 8 people online (£9 a head) allows you to try their festive platters: a selection of their best jerk offerings, crispy seafood platters and fresh accompaniments such as pineapple salads, corn breads and fritters. 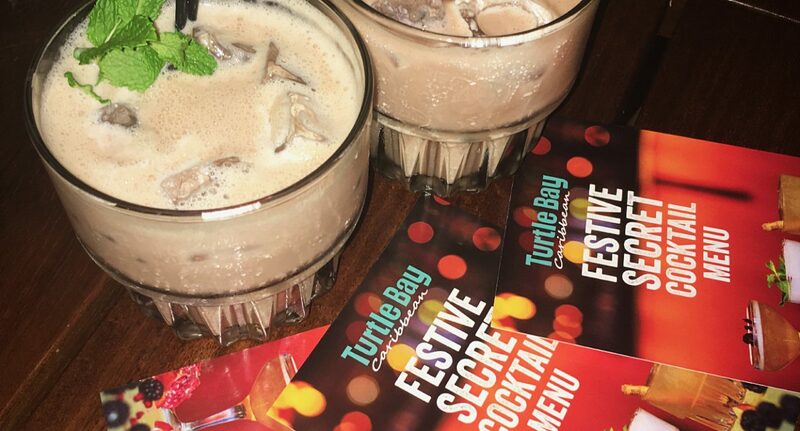 One part of Turtle Bay’s Christmas Menu that is undoubtedly festive are their three new Christmas cocktails. These cocktails are unofficially official. A secret menu feature that demands bravery and possible humiliation when asking the attractive waiter for a ‘Merry Berry’. But don’t worry, you should be greeted with a creamy amaretto and baileys cocktail and not public embarrassment. If you’re like me and hate anything dairy (except cheese: cheese is a bipartisan product) the ‘Three Kings’ may be more to your liking: apple, rum and cinnamon (complete with cinnamon stick). This second secret cocktail was my firm favourite and was extremely reminiscent of the mulled drinks at a Christmas market. Lastly, the most alcoholic was the ‘Sleigh Slipper’. Whilst being almost criminally rum-packed, the blackberry liqueur and citrus base makes it refreshing and warming.